“The zombies were having fun. The party had just begun. The guests included Wolf Man, Dracula, and his son.” That optimistic sentiment might have been fine in October 1962, when Bobby “Boris” Pickett And The Crypt Keepers hit the top of the Billboard charts with the cheerfully spooky “Monster Mash,” but it doesn’t quite “cut it,” to use a Pickett-esque pun, in 2014 when our movie monsters habitually eat their victims’ livers and hack up their bodies with chainsaws. 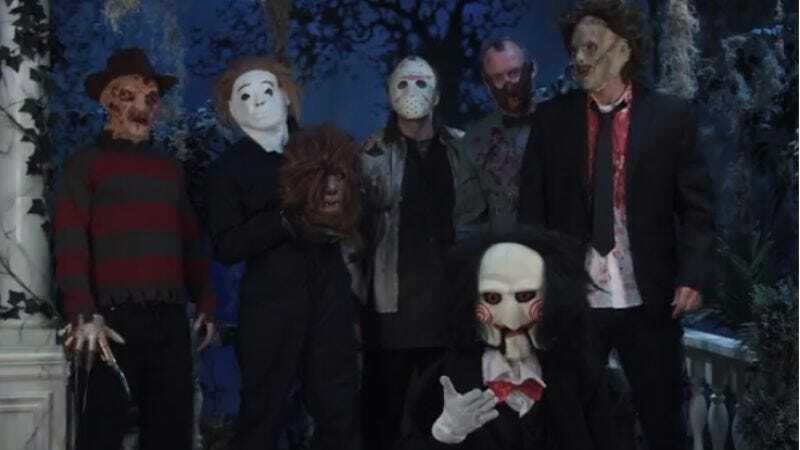 Luckily, the Key Of Awesome has given the quaint, 52-year-old novelty song an appropriately gory update with such newfangled bogeymen as Freddy Krueger, Michael Myers, Jason Voorhees, Leatherface, the Saw puppet, and even good old Hannibal Lecter. The lead vocals, however, are still handled by a Karloff-accented Frankenstein monster, who demonstrates genuine revulsion at the gruesome and uncouth antics of these latter-day horror stars. “Is it too much to ask to have some monsters dance?” he pleads. The cinematic underclassmen aren’t too into old-fashioned dance crazes, but they do try to appease their elder… with predictably ghoulish results.